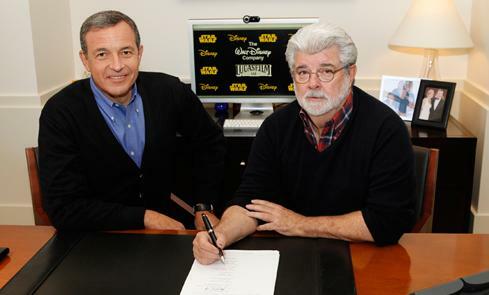 Walt Disney Company have snapped up Lucasfilms yesterday and with it goes all the rights to Star Wars and Indiana Jones, plus LucasArts, Industrial Light & Magic and Skywalker Sound. Disney also gets all of Lucasfilms designs and ideas for the new Star Wars episodes they were thinking of making. The leader of Lucasfilms, George Lucas, will stay on and act as a creative consultant to the company. We believe that Disney want Lucas to keep helping them with the new Star Wars episodes they will be making. Disney state that the first new film, Episode VII, will be released in 2015. There is no word on what the storyline will be nor how you can really start after the celebration of defeating the Sith and “rebalancing” the force. We believe that the new Star Wars will focus on a different set of actors, with Luke Skywalker and Princess Leia in their elderly stages. Even though George Lucas swore that Episode III was the last he would do, it seems that Disney’s money and motives have moved him to the idea that Star Wars should live past his lifetime and that Disney should make more and more films. A video posted on YouTube details why Lucas decided to sell the rights and company to Disney and how he believes making new Star Wars episodes is the right thing to do. There are three new episodes planned, with Disney saying they will roll them out every two-to-three years. The acquisition cost Disney $4.05 billion and it adds to their umbrella of companies they now own. With Pixar, Lucasfilms and Disney all under one branch, we believe the next Star Wars may be the biggest episodes yet, with remarkable visuals, we just wonder if Disney will make the plot like Lucas did.